The Index is developed based on cases where employees missed six or more days of work and the cases were then ranked by total workers compensation costs. 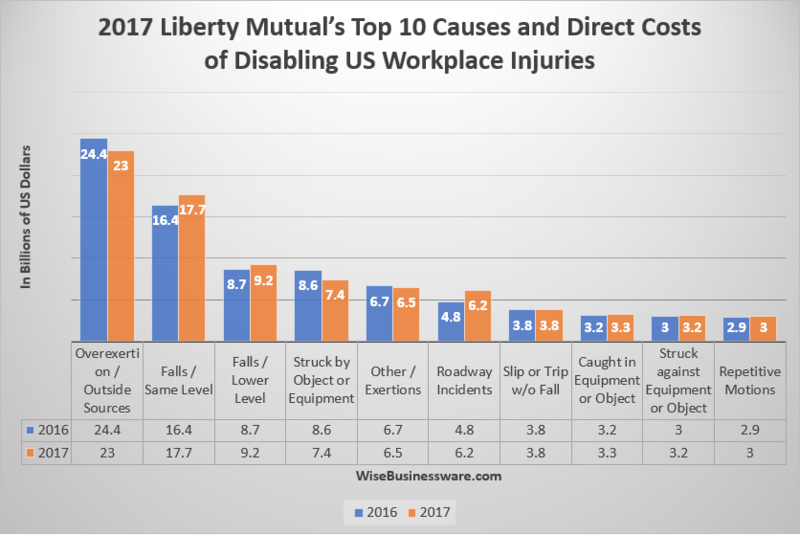 Below is an executive review on the 2017 Liberty Mutual Workplace Safety Index report to help arm you with the knowledge and power to have a positive impact. The new report opens with a shocking statement: U.S. businesses now spend over a billion dollars a week on serious, non-fatal, workplace injuries. More precisely, it cost companies $59.9 billion as of 2014, based on the latest information provided by the Bureau of Labor Statistics and the National Academy of Social Insurance. Together, the top 10 causes accounted for 83.4% of the $59.9 billion total cost of all injuries. Overexertion ranked first as the most expensive category of disabling injuries. The report defines overexertion involving outside sources as injuries incurred when employees do excessive lifting, pushing, pulling, holding, carrying, or throwing objects. All of these make up 23% of the total cost burden. In total, this makes up an astonishing $13.79 billion dollars of the 59.9 billion total cost of all injuries. Second to overexertion involving outside sources is falls on the same level. These cost companies $10.62 billion per year and make up 17.7% of the above total. It's not a surprising finding, and it's one you may fear the most based on the diminishing work space trends and poor housekeeping practices. Based on 2014 published data from the Bureau of Labor Statistics, 261,930 private industry workers missed one or more days of work due to injuries from falls on the same level or to lower levels, and 798 workers died from such falls. Falls from a high level to a lower level ranked third at 9.2 percent, costing companies $5.50 billion. Being struck by an object or equipment on any part of the body came in fourth at 7.4 percent, which brings a $4.43 billion cost annually. Other exertions or bodily reactions came in fifth at 6.5% costing $3.89 billion. With these top five injuries taking up 63.8% of the total cost, they require serious examination in the workplace. What about trends in the time accidents occur? According to the Bureau of Labor Statistics in 2014, 67 percent of nonfatal workplace injuries and illnesses occurred during the hours of 8:01 a.m. to 4:00 p.m. Of the injuries and illnesses during these hours, 331,390 occurred in morning hours, and 249,890 occurred in the afternoon. Sixteen percent of non fatal workplace injuries or illness occurred from midnight to 8 AM. At the end of this year's report, we a few positive changes from last year. Most notably, total cost of disabling workplace injuries went down roughly 2 billion dollars. Plus, three categories decreased - overexertion injuries, struck by, and other exertions; while, slip or trip without fall stayed the same. Unfortunately, six of the ten categories increased - falls at same level, falls at lower level, roadway incidents, caught in equipment or object, struck against equipment or object and repetitive motions. See the chart above for change in values by category. Do you have the tools to decrease your workplace injury risks in an efficient and cost effective way?